Updated 4 p.m. | Posted 11:20 a.m.
Gov. Mark Dayton and GOP leaders talked taxes and public works bills Tuesday afternoon, but there's no deal to move forward with a special session and they don't plan to talk again until next week. Republicans emerging from a brief meeting with the governor made it clear that divisions remained on any next steps to salvage tax cut and bonding legislation. "It's better we take our time and do what's right rather than rush into something again," Minnesota House Speaker Kurt Daudt, R-Zimmerman, told reporters. Dayton allowed a tax cut bill to die without his signature at midnight Monday because of a wording error that would have cost the state $100 million over the next three years. He said Tuesday morning that he wanted a special session. Daudt said the wording mistake could have been fixed easily and Dayton vetoed the bipartisan tax bill as leverage to get legislators to approve a package of new spending in a special session. 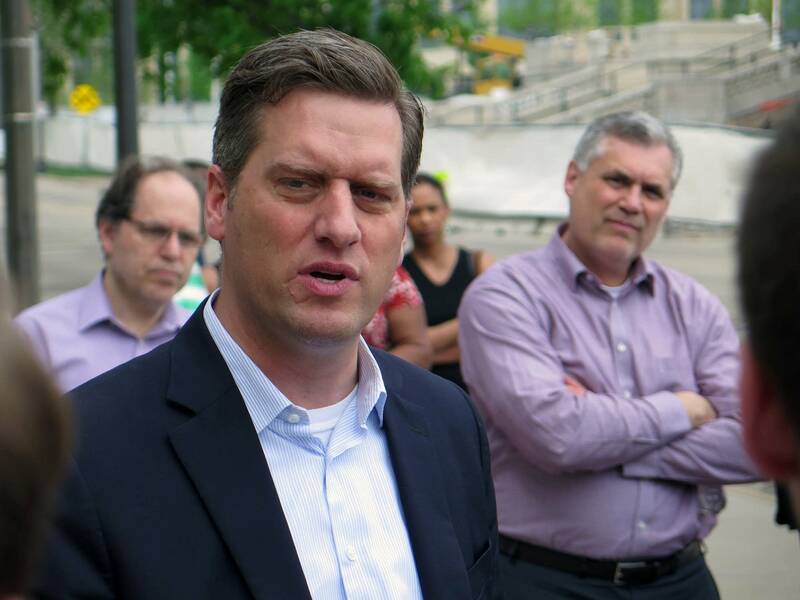 "I think folks are disappointed that the governor vetoed the tax bill," Daudt said. "I'm disappointed. I think he's using the error that was in the bill as an excuse to veto it. I think that's pretty obvious." The bill would have delivered hundreds of millions of dollars in new credits, exemptions and deductions. Besides the relief for farmers, businesses and college graduates, the plan also included a property tax write-off sought by the developers of a new professional soccer stadium in St. Paul. Dayton insisted he was not holding the bill hostage and he blamed House Republicans for the chaotic end of the session that led to the costly error in the tax bill. "They screwed it up," he said Tuesday morning. "I was not going to sign a tax bill with a $100 million error. That would be foolish." The one-word problem was in a section dealing with tax rates for bingo halls. In defining the facilities that were eligible, bill writers included an "or" instead of an "and" in the criteria. That had the potential to turn an intended $1.5 million provision into one that would cost the state $101 million and threaten the funding stream for the new Vikings football stadium in the process. Republican Senate Minority Leader David Hann said a special session should come soon. Hann said he's worried about election-year politics getting in the way of a potential agreement. All 201 House and Senate seats are on the ballot in November. 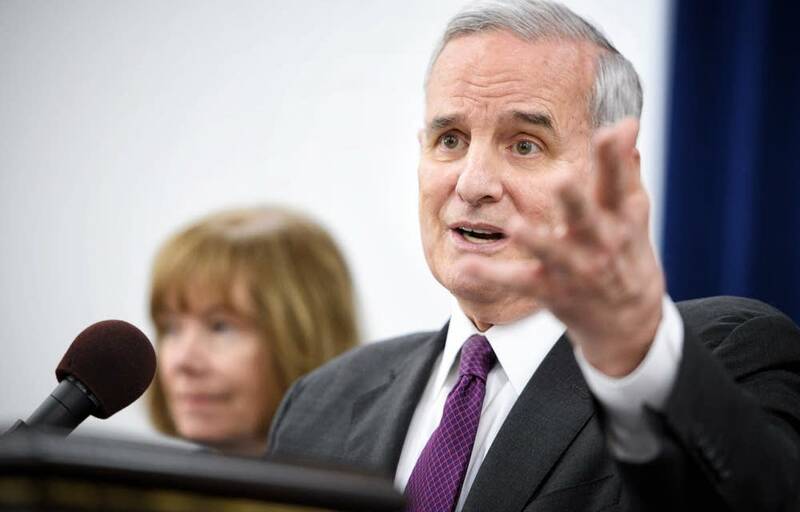 Dayton had come under intense pressure from Republicans, groups with a stake in the bill and ordinary Minnesotans who said they would stand to gain from the various breaks. The governor said he would sign a tax bill that fixed the and-or error and also made permanent the Minnesota State High School League's sales tax exemption on tickets and admissions to league-sponsored events. He was angered the Legislature did not extend the high school league's tax break, which he said would have cost the league hundreds of thousands of dollars that it uses now to help fund high school sports in Minnesota. He also warned of reopening the tax bill beyond those two changes. "If they open it up, there's going to be a free-for-all." He also pushed again for a projects bill that would include money for repairs at Minnesota State Colleges and Universities institutions as well as a new life sciences building for the University of Minnesota. In his morning remarks, the governor said there was still time in June to get it done.